The world was in the grip of the Great Depression in 1936 but by 1936 this was not news.The world had come to accept the economic situation with remarkable stoicism. Most news in 1936 was made by the European fascists, Hitler, Mussolini and General Franco of Spain. Hitler invaded the Rhineland and threw his political and military support behind Franco’s rebels in their ultimately successful attempt to overthrow the Republican government of Spain. 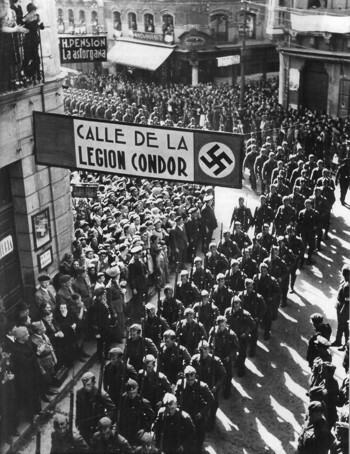 Above is a photo of the German Condor Legion in Spain during the early stages of the conflict which began in the summer of 1936. Thousands of idealistic American volunteers enlisted in the Abraham Lincoln Brigade to fight in the losing battle against the fascists and approximately a third of them were killed. Hitler was also busily at work at home consolidating his popular support in anticipation of the European war, the timeline for which he had already secretly decided. One of his national initiatives was the construction of a “People’s Car”-in the German the Volkswagon. By 1938 the Volkswagon was rolling off the assembly line. 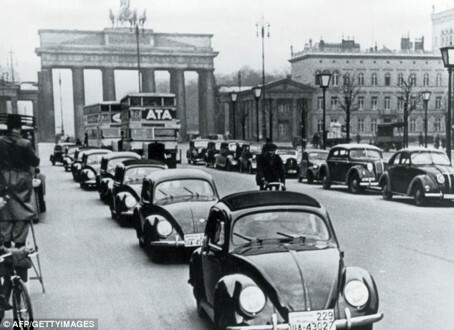 A line of early “bugs” can be see seen with Berlin’s Brandenburg Gate in the background. The design was so popular it survives to this day. In England the populace found itself somewhat distracted from the ominous storm clouds over Europe and the empty pockets of its citizens by a royal mess. The Queen Mary had made its maiden voyage on May 27th, 1936 from Southhampton England to New York, arriving June 1st. The Brits were very excited about the Queen Mary and what it portended for the future of British shipbuilding and engineering expertise in general but this excitement was soon tempered by an inconvenient truth, when the ship returned to England it would be full of Americans who the Brits found uncouth, arrogant and speaking an unpleasant bastardized version of their cherished language. Relations between the countries had not been good since the end of the First World War. 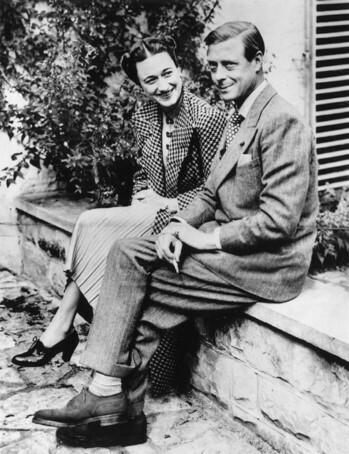 They were particularly upset about one Yankee, Wallis Simpson, an American socialite who had, they believed, seduced their gullible and rather dim new king, Edward VIII. In the fall of 1936 Edward informed the Prime Minister, Stanley Baldwin, that he intended to marry Mrs. Simpson who at the time was still married to a Mr. Simpson. Mr. Simpson was to disposed of by an American divorce court. The British establishment and public were not amused and shuddered at the idea of a twice divorced American, Wallis had had a previous divorce, becoming Queen. The British Secret Service had her followed and tapped her phone compiling evidence that she was a gold digger- probably true, whether king or not Edward was one of the richest men in Europe, a Nazi sympathizer- perhaps but she was basically apolitical and cheating on Edward even before the nuptials-maybe. In the end Edward was given the choice of Wallis or the throne and Edward, abdicating, chose Wallis. This should have come as no surprise as Edward, although probably not mad as a hatter as some who knew him contended, didn’t like the job of king. He was lazy, spoiled, narcissistic, not very bright and didn’t really relish the responsibility which attended the role of king of the British Empire. He and Wallis married and moved to France and later Portugal. During the war he was sent to rule over the British Bahamas where Wallis’ profligate spending habits, according to Winston Churchill, drained the treasury. 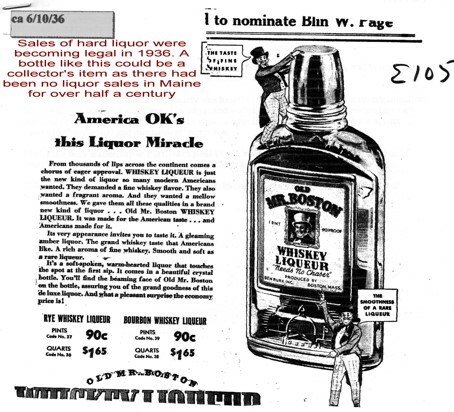 In the U.S. the Depression was showing few signs of ending but this did not prevent Roosevelt from winning a landslide victory over Al Landon. The Hoover Dam was completed, Gone With The Wind published and, more importantly, the bottle screw top was invented. In baseball the Yankees set a number of records. On May 24th they beat the A’s 25-2, Tony Lazerri hit 2 grand slams and had 11 RBI’s and Ben Chapman reached base 7 consecutive at bats. Two weeks later the Yankees beat the Indians 5-4 in 16 innings, a game in which not one strikeout was recorded by either team. Naturally the Yankess won the World Series in 1936. Late in the season the Indians, long out of the running, brought up a 17 year to try his luck against the St. Louis Browns. He struck out 15 in that first game but was apparently just warming up as he struck out 17 in his next game. His name was Bob Feller and he was one of baseball’s best. 1936 Downeast is remembered for the Lubec tragedy in which 12 children died during an outing at Gardner Lake when their boat capsized. 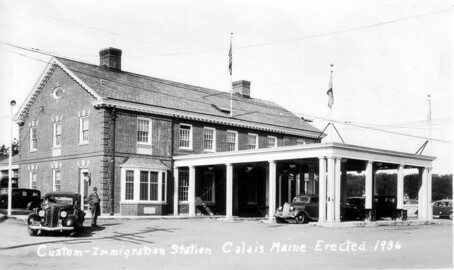 The full story of this tragedy can be found on the Town of Lubec webpage. 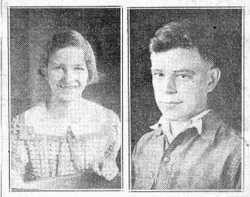 Only three of the children in the boat were saved including Miriam Kelley who was saved by Wyman Ramsdell. “One day in 1936 school children went to spend the end of the year by going on a boat at Gardner’s Lake. The boat flipped over. Miss Mimi Kelley who was saved by Wyman Ramsdell is the last living of the three children who survived. This made me feel a little sad because so many died.” Robert Wallace, 10. “Terrible. It was terrible. When you hear a word of it, you can see it in your head. You feel so bad; Miriam’s friends were gone. She never went back to Gardner’s Lake for 27 years! I would’ve waited longer, maybe never. She handled it far better than I would have, although she was not to speak of it. Ever. Mimi was lucky Wyman Ramsdall was there to save her. They arrived children, students, and friends. They left crying, grieving, a smaller crowd. Wyman Ramsdell lived near to Miriam, and the day of the accident saved her life. I wouldn’t have been able to bear such a tragedy.” Emma Page, 9. “It is terrible to read, hear, and think about. It was so sad to hear about all the children dying. Miriam Kelly the only survivor living today (2009). She was so lucky that Wyman Ramsdell grabbed Kelley by the hair of her head to stop her from drowning. Kelley said, ‘I just wanted to lay down and go to sleep.’ Kelley’s sister Ellen was the last person to get in and luckily she jumped out before the boat took off. Wyman is a lifesaver for helping Mimi stay alive. When I hear about this tragedy I feel bad for all the people that died. But we always have to remember it wasn‘t anybody’s fault. It was an accident that happened that day.” Stephanie Wright, 10. “When I first heard about the terrible drownings I felt sick. I feel badly for all the people who lost their lives. I wanted to know more. I really do hope all kinds of people think about this day of sadness. There were only three survivors among the children and one of them is Mimi, my best friend’s grandma.” Austin Serrato, 10. “I hate to think of these children drowning. I thank the people who saved them. Wyman Ramsdell is like a hero to me because if he didn’t save my grandmother then I wouldn’t he here right now. My grandmother used to tell me this story. I didn’t know how bad it was until now. It shocks that there were only three survivors and my grandmother is the only living survivor. It was very brave of the people who saved the three.” Seth Doherty, 10. *Other survivors were Barbara Tyler and Leah Wilcox. Those who perished were Leverne Dinsmore, Roland Eaton, Jerome Kinney, Raymah Knowles, Merle Lewis Jr., Evelyn and Aaron Mahar, Daniel McCurdy, Glenn Morey, Frank Reynolds, Christine Sleight, and Doris Small. 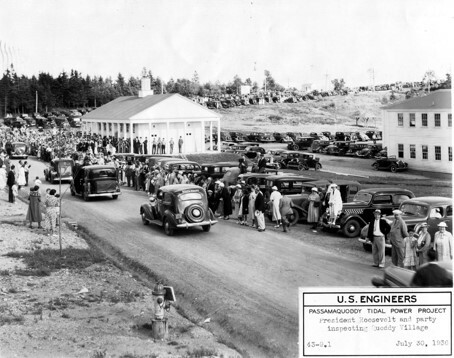 In Eastport President Roosevelt arrived for a visit to site of Quoddy Dam project which it was hoped would revitalize the Downeast. Roosevelt was an enthusiastic backer of the project but it was on the ropes in Congress which had other priorities and even Roosevelt understood the necessity of focusing the national attention and resources on the national defense. Roosevelt understood that war was coming to Europe and the United States could not long avoid involvement. Soon after the visit the project was cancelled and the site became a Seabee base during the war. In Calais the new customs house opened at Ferry Point. 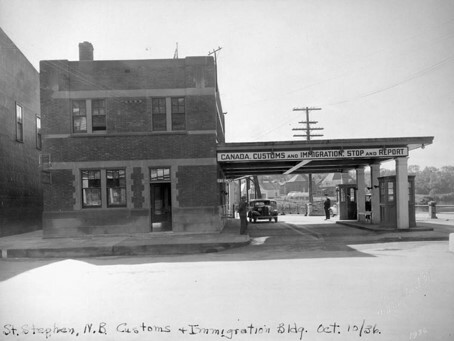 Canadian Customs in 1936 was as many of us remember it. In St.Stephen C.N. Vroom died. He was a noted businessman and town official. At 18 he was appointed the first town clerk of St Stephen and he held the position, along with police magistrate for many years. 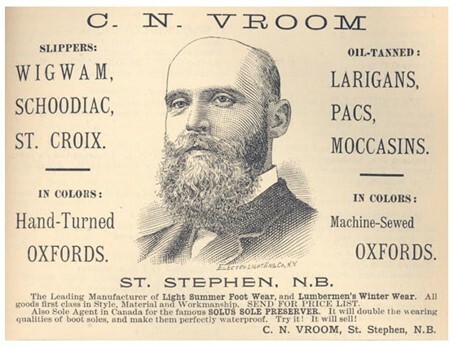 Mr. Vroom was most well known however for establishing the first bootang and larigan factory in Canada. The larigan/bootang was an oil leather moccasin with flexible sole which was waterproof and extended to just below the knee. Woodsmen loved it and Vroom soon had lots of competition. It was the model for the trench boot worn by soldiers during the First World War. His store which also sold furniture can be seen above. 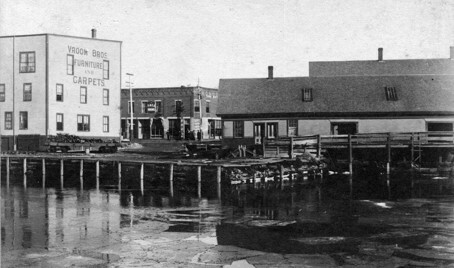 It was on the waterfront and town wharf very close to what is now Pizza Delight. Down on Passamaquoddy Bay the locals were excited to observe the German airship Hindenburg “cruising very low and at an amazingly slow rate of speed” on its way to Europe. According to the St Croix Courier “Hundreds of people living here (Lubec) and elsewhere in the Quoddy districts were thrilled at the sight of the big dirigible as it glided along the coastline on its flight from Lakehurst New Jersey to Freidrichshafen Germany. Few people living in this section of the country have ever seen a dirigible before and much to their regret there are many more who entirely missed the “sight of their lives”. 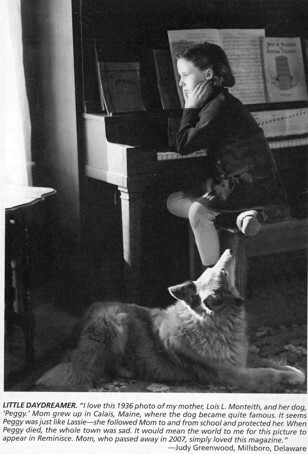 We’ll end this week on a cheerier note with this 1936 photo of Lois Monteith. City record show Lois lived with her mother Mary at 52 Barker Street Calais.